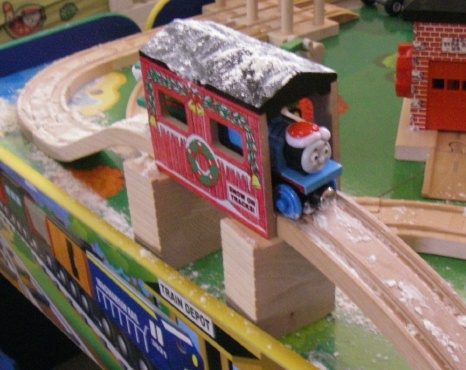 Sammy and I found a way to have some snow here 🙂 Thomas found the tracks to be a bit slippery with all that snow…(flour). It was fun to make it snow in Hawaii! What an incredibly fun mommy you are! And remember, he’s finally at the age where memories will “stick”, so you’re also mentoring for him the kind of woman he’ll be looking for to marry. Such fun and important times!